You could get lucky winning the lottery but you don't get lucky building a $500 million dollar revenue generating business. It's not all glitz and glamour being in business and it's not all selling companies for $1 billion dollars. You could get lucky by winning the lottery but you don’t build a $500 million-dollar energy giant by luck. Blood, sweat, and lots of heartache, failures, disappointments and lonely nights encompass what seems like an overnight success. Tom Cummins, CEO of American Power and Gas has been an entrepreneur for quite sometime and could definitely tell you his tale of successes and failures in entrepreneurship. 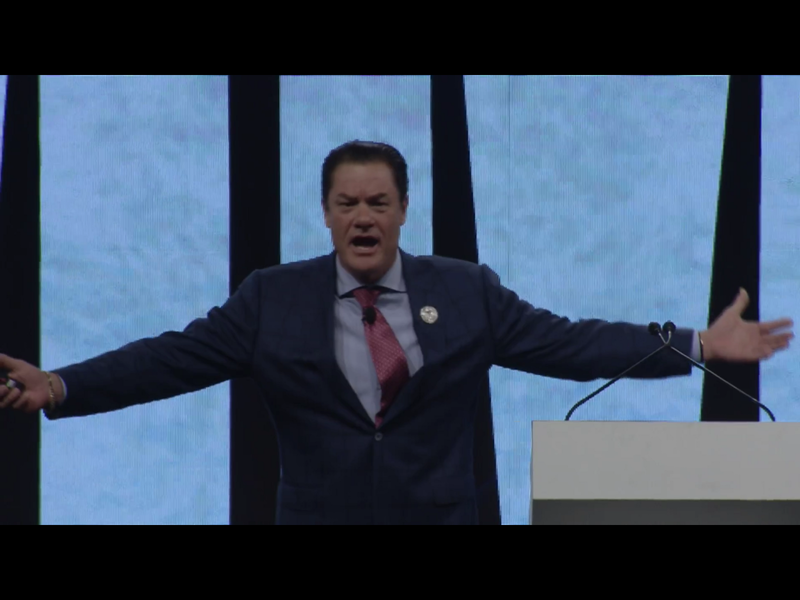 He has also spoken at the 1st 10X Growth Conference hosted by Real Estate and Sales Mogul Grant Cardone in his Billion Dollar Panel. Sit back, relax and get on your reading glasses because you won’t find an in-depth story of the humble beginnings of a CEO and business tycoon like Tom Cummins anywhere on the internet. Fahad Mohammed: What is your backstory? What made you an entrepreneur? I’ve always been a hard worker. When I was 25 years old, my sister and brother-in-law helped me start my first business, which involved selling expendable computer and office supplies. It was so successful that it made the Inc. 500 list, and it just kept booming. This was a time when I was a single man living in Southern California and was surrounded by sun, entertainment beautiful and busy beaches. But despite all the alluring distractions, I maintained an amazing work ethic. I showed up at 6:30/ 7:00 in the morning, every morning. I worked in the sales area of my company until about 2 p.m. Then I drove all over Los Angeles to buy the merchandise for my business and brought it back to the office. By 7:00 p.m., I left the office and I attended night school until 10 p.m. so that I could receive an education. I was consistently industrious and was dedicated to making sure all aspects of my company were done correctly. By this time, I was 38 years old, and I said to myself, “You know, I don’t like this – I’m going to retire.” I was making, in those days, an amazing amount of money – about $50/$60K per month in residual income. I enjoyed retirement for about one year, and then the people who were paying me my retirement money robbed me, quite frankly. I don’t know how else to word it – they embezzled and cheated me. So, my retirement was short-lived, and I went back to work. I was dabbling around with a few different endeavors until one day when I saw an article in the Wall Street Journal. It stated that the energy industry was about to go through deregulation, and I said to myself, “Perfect!” I knew nothing about the energy industry but was familiar with deregulation because I lived through the deregulation of the telecommunications industry, so I understood the concept and how to achieve success through it. During this time, I began working for someone but soon decided to start working for myself again. I realized I had an entrepreneurial spirit, and it was getting stifled working under another person. We eventually found a big company who wanted to play a big game with us, and it became one of our partners. Then in January of 2014, we had a big weather event occur in the United States, and the energy industry went psychotic. As a result, we almost went out of business because we were missing some vital data on how deal with these situation in relation to the energy industry. Then we started working 15-20 hours per day just figuring out what we needed to do to solve the problem, and we did it. We pulled the proverbial fat out of the fire. Since then the company’s been growing like no one’s business, and it’s been growing beautifully. Next, we got involved with green energy, which has been amazing. Today American Power and Gas is bringing in just about $500 million a year in revenue in addition to good profits and we’re also now moving into Europe. We’re starting all over again from zero, and we’re figuring it out and we’re moving forward. So, it’s very exciting. Fahad Mohammed: If you had to define what your company American Power and Gas does, what does it do? Tom Cummins: I’m in the energy business, but I’ve never lost sight of the fact that I’m a sales company first. I happen to be working in the energy business. I’ve never lost sight of what I do for a living, and that is that I sell things. Fahad Mohammed: What do you think makes American Power and Gas stand out? Tom Cummins: First of all, the finest resources I have are in our executive strata. I don’t care what kind of company you have ––all of them are people driven, right? This executive structure I have is the finest I’ve ever participated with or worked with, much less have had work for me –– ever. What makes AP&G tick is just amazing. The executive structure is just amazing because everybody holds their zones and keeps them thumping. Second, we have the fact that we were the pioneers of going green with our customers and getting our customers to go green with us. I think we’re one of the few, if not the only energy company, out there that has about 40 percent of its base as green energy. Third is the fact that we never, ever lose sight of being a sales company. We never lose sight of this. Our fourth quality is how we take care of customers. We have hundreds of thousands of people we deal with, and our ability to take care of them is genius. We’re geniuses at customer service. If you have a problem, you call us and you won’t end the call still upset. We handle the upsets. Fahad Mohammed: When you had difficulties like, for example, those situations when you had to start from zero, how did you get yourself motivated again? Have you ever lost your motivation in the first place? Tom Cummins: Never. There are maxims such as, “you can’t keep a good man down,” and “it’s not how hard you fall, but how fast you get back up.” I’d have to say these are attributes that I innately have. I’ve had some train wrecks in my professional life, and they hurt. Emotionally, they are devastating to you as a man. Something happens, and it’s just over. All of your hard work is down the drain. Those are challenging times. But the most important thing is this: how fast do you come back? What are you going to do next? How fast are you going to start it? And how fast do you pull it off? One of my stronger attributes is the average time I redeem myself from a shattering situation and have a new business venture underway, it’s a matter of weeks. I don’t sit around moping –– I get back to work. Fahad Mohammed: Is there a person or mentor you would want to thank for helping you to obtain your goals? Tom Cummins: I have some philosophers who I’ve studied. I’ve read every sales book in the world that I can get my hands on. But I’d have to say that back in the day when I first wanted to become a salesperson Doug Edwards and then Tommy Hopkins were my mentors. Those were the two 800-pound gorillas when I was a young man, and I must’ve listened to their tapes 500,000 times. I’m not kidding. I was always either reading their books or listening to their tapes when I drove around town. Fahad Mohammed: What is the most innovative project you’ve ever worked on? Tom Cummins: There are a couple of them. Number one is I cracked the code of how to own my own call center, and I opened our office in Colombia. That was one of the hardest things I’ve ever done, but was one of the most rewarding, as well. This office became a game changer for our company, but the challenges we faced in order to make its establishment a reality were unbelievable. Number two is building a green energy company. You have to charge customers a little bit more because its cost is higher, and there are many competitors out there who are tempting customers to switch back to brown power with their low prices, and it’s frustrating. It’s about having that determination to persevere and stay true to your beliefs and purposes. Tom Cummins: Number one: one of the things I wish somebody would have told me is that we don’t live in a perfect world. Things happen. You can have upsets, but the key is don’t let them sit there and fester. Number two is this: When you’re at the top of the organizational structure, hopefully, you’re there because of your proven talents and abilities, right? With this in mind, you’re going to have a lot of people who work for you and bring you problems that are really fun to solve. However, by solving your employees’ problems for them, you actually put them at a disadvantage. Let’s face it. In life, the real joys come from solving problems. Therefore, don’t take the most delicious part of a job away from your subordinates by solving their problems. Let them solve their problems. That’s how you build a better team and enable your staff to achieve pride in their own areas. Number three took me decades to solve, and it’s this: how do I increase my odds significantly in hiring the right people? Some tips I wish I had decades ago are the skills and the knowledge of how to construct a personnel department that provides me with information from which I can discover who my employees are before I hire them. In the past, I’d have to hire candidates, wait three months to discern who they are, and then have to dismiss them if they’re not the right fit. This system is a waste of time and money. It took me quite a while to develop a list of questionnaires that gives me an idea of who each new hire or potential employee is, what is important to him or her, and how to break through any facades that may exist. Number four is key, and it’s this: Since being an entrepreneur for going on 40 years now, a key skill I’ve taught myself over these last few decades, is how to know exactly where my finances are at all times. Once a week, I confront the finances of the company, and I don’t mean the financial statements – I’m talking about the cash flow models. Here’s number five, and it’s not a pretty subject. This is just fact of life: we are all trying to expand our businesses. We’re always trying to do more, get more, have more and be more. It’s all about that four-letter word: more. This is how an entrepreneur and a business owner operate. Everything you need to do to expand is within the capabilities of your organization, and if you’re pushing hard as an executive to get your company’s statistics up and you find yourself saying “Why is this so impossible to do?” you need to understand this point: Someone within your group is pushing just as hard to keep your statistics down. Someone has a disagreement about how you’re doing business, and he or she is trying to hold your statistics and your production down. Resultantly and immediately, you need to ferret out these types of individuals and dismiss them. You have the evil individuals and the incompetent ones, I don’t know which is more dangerous. Evil people are intentionally malicious, and the incompetent ones are actually trying to help but lack the skills or knowledge to do so. As a senior executive, you have to watch out for both types. You don’t need these kinds of people because they’re the ones that will make you fail. This is pivotal wisdom I wish I had 30-40 years ago.